If you are a Man that spends his days using the different tools of the trade, then your hands probably show it. You have battle scars and calluses that match up perfectly with every imperfection on your favorite tool. When the tool doesn't fit your hand, your hand does a better job of fitting the tool. Your hand tells the world that you can build things, and O'Keeffe's Co. wants them. O'Keeffe's Co. is on the hunt for a pair of working hands that they can use as a symbol of the dedication that Americans put into their jobs. They want you to enter your hands or nominate a pair of hands that you think are the hardest working hands in America. 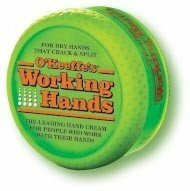 The person with the hardest working hands in America will receive a grand prize of $5000, a lifetime supply of O’Keeffe’s Working Hands moisturizing cream, and potentially be featured in a national advertisement for the brand. O’Keeffe’s will also award five runners-up, whose hands are symbols of the great work being done in America, $1,000 and a one-year supply of Working Hands.